The Best Version of KFC is Korean Fried Chicken - FiliVino! Having traveled to Korea multiple times and living in California for most of my life, I have been lucky enough to partake in KFC… “Oh, the Colonel” you say. No, not that KFC, although I have had that more times than I should admit. Even tried that double-down monstrosity. No, I mean Korean Fried Chicken. Whether having it in Korea or having it at Bon Chon (I’ve visited locations in Boston, California, and now even Orlando!). Well if you’re going to eat me, let’s have a shot! “So what?” you grumble at me. Well, I”ll tell you “what”! 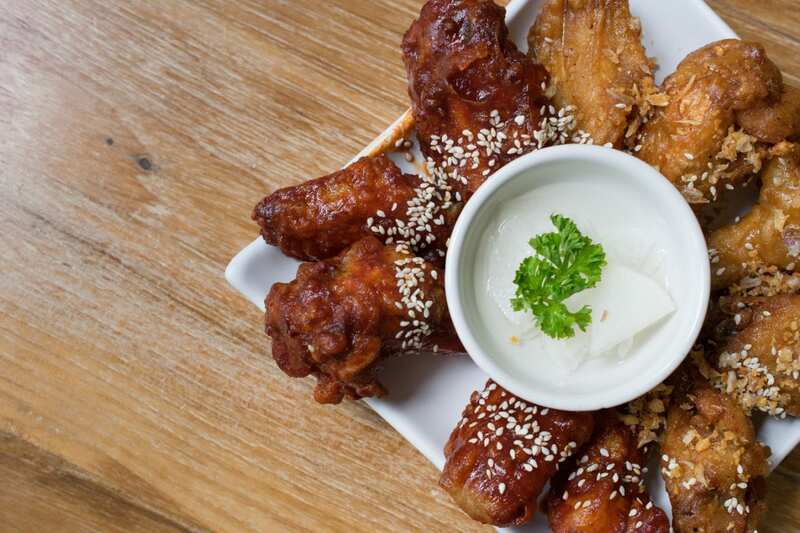 Korean Fried Chicken is the most transcendent chicken experience you can have. The chicken is moist and the skin is thin, crispy, and intensely flavorful. I’d say the crispness is akin to having enveloped a chicken leg in a potato chip. And so long as you don’t let it steam itself, it will stay crispy for quite some time. So what’s the secret? The main thing is the double frying. I’m guessing it’s something that may have originated with being able to precook batches of chicken before being ordered. The first fry cooks it at a normal temperature returning edible, tan chicken. The second, hotter further crisps the skin without further cooking the chicken inside. Generally when you order Korean Fried Chicken, you have a choice of Soy-Garlic flavored, or spicy. Or both. Get both. And order all of them. You’ll be surprised how many chicken legs you can eat in one sitting! Oh and you see the humanoid chicken up there? He recommends you have a drink with your KFC. Either Soju like our friend there (I prefer Bek Seju), or a light beer. Chimaek is a popular combo in Korea Chi (Chicken) and Maek (Maekju/Beer). <span></span>Korean Fried Chicken - KFC is the most transcendent chicken experience you can have. The chicken is moist and the skin is thin crispy and intensely flavorful. Combine 2 tsp salt, ¼ cup corn starch, and ½ tsp baking powder in a large bowl and whisk fully. Add chicken (I use drumsticks) and toss until completely coated. Combine remaining cornstarch, ½ tsp baking powder, flour, and 2 tsp salt and whisk until fully combined. Add water and vodka and whisk until smooth. If too thick add a bit more water. It should be a pretty thin consistency. Add half of the chicken to your batter. Working with one piece at a time, lift the piece out allowing excess to drip off and use your finger to help get rid of any large dollops of batter. Lower chicken slowly into fryer. Repeat with remaining pieces, cooking each piece about 8 minutes when golden brown. Move chicken to a wire rack to drain. Fry the chicken for 2 more minutes. Whisk together all ingredients adding water to ensure consistency. It should barely stick to a spoon. Either toss with plain chicken, or serve on the side.